Since 1989, grant funds have been available in New Jersey for the preservation and restoration of our historic buildings and structures, including those owned and occupied by religious institutions. The criteria for funding such buildings has been consistent; a church, synagogue, mosque, or other religious building must be listed on the New Jersey or National Registers of Historic Places and be a valuable historical resource to its community. The purpose of these grants has been to protect state, regional, and local landmarks, and not to promote any single religion or support religious activity. Unfortunately, the New Jersey Supreme Court recently ruled to prohibit Morris County’s Historic Preservation Trust Fund program from funding historic buildings owned by religious organizations. This ruling came as a result of a lawsuit filed in 2015 by a resident of Madison with the aid of the national organization, Freedom From Religion Foundation based in Wisconsin, who claimed that the preservation program violated Article I, Paragraph 3 of the New Jersey Constitution. The NJ Supreme Court Justices agreed. The programs that fund historic preservation recognize that religious activity may take place within the buildings, but funding is not in support of these activities and is solely for the preservation of historic exteriors of a variety of building types. The ruling has the potential to have a cascading impact on historic preservation programs statewide, putting many of our most valued architectural resources and historic landmarks at risk. Churches, synagogues, mosques, temples, and other buildings owned by religious institutions are valued physical reminders of our cultural heritage, and often serve as the centerpieces of our historic downtowns, urban centers, and rural landscapes. Historically, churches and synagogues were the first edifices constructed when a town was created, or the first institution constructed to support newly arriving immigrants. As such, the buildings themselves hold value beyond the activities conducted within them; they are physical reminders of how a town or neighborhood developed, and often help to serve as identifiers in the landscape. The NJ Supreme Court’s decision noted, “The plain language of the Religious Aid Clause bars the use of taxpayer funds to repair and restore churches, and Morris County’s program ran afoul of that long-standing provision.” In the opinion of many attorneys and the preservation community, by interpreting the constitution in plain language, the Court missed the distinction between building repair and restoration. The funding provided by the Morris County Historic Preservation Trust Fund is specific to aiding organizations in preserving and restoring their historic buildings by utilizing historically appropriate materials and specific conservation techniques, so that all work complies with the Secretary of the Interior’s Standards for the Treatment of Historic Properties. These guidelines, established under the direction of the National Park Service, are utilized for all publicly funded preservation projects. 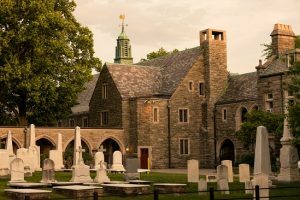 The religious organizations that received funding from Morris County, and other programs like it in the state, underwent the rigorous process of listing their buildings on the New Jersey Register of Historic Places, thus substantiating their eligibility for funding. Additionally, the Morris County grant program, and other programs like it, received voter approval through referendum on the open space, farmland, and historic preservation programs. In early May 2018, the Morris County Freeholders authorized the Becket Fund for Religious Liberty to file an appeal to the US Supreme Court to overturn the NJ Supreme Court decision. Preservation New Jersey supports the efforts of Morris County to continue to fight for a valued and worthy historic preservation grant program that benefits all residents of New Jersey.